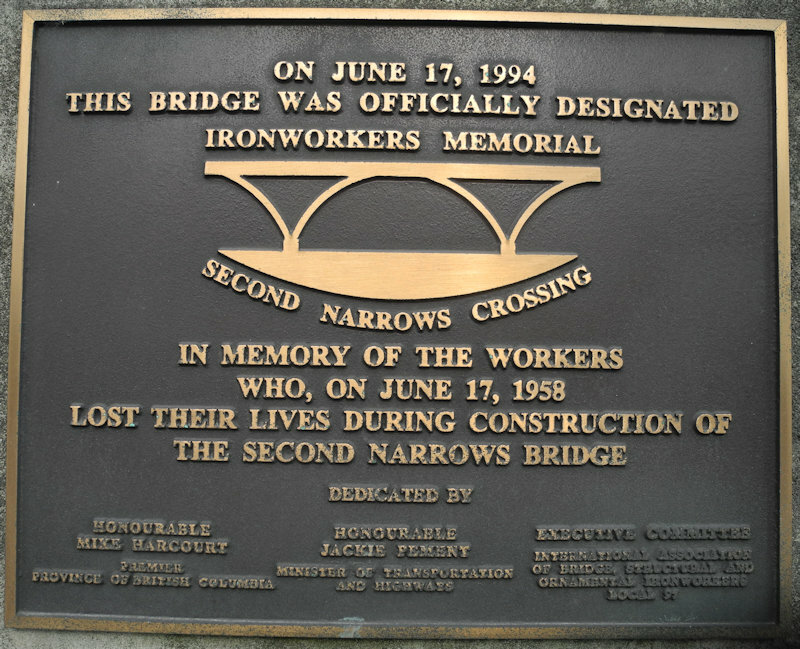 A ceremony will be held to recognize the 59th anniversary of the collapse of the Second Narrows Bridge Saturday June 17th at 1 pm. On the afternoon of June 17th 1958 during the construction of the bridge there was a shudder and a boom followed by the collapse of the span. 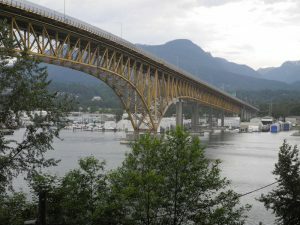 The span which collapsed was the central span of the bridge, the longest one at 1100 feet, requiring temporary supports to hold it in place until it reached the pier on the south side. It was the most difficult, technically, of the seven; that single span arching high in the air, was one quarter of the length of the entire bridge. 79 workers fell from the bridge, some to bottom of the inlet; and 14 Ironworkers, four other bridge workers and one rescue diver were killed in the worst industrial accident in the Vancouver area. 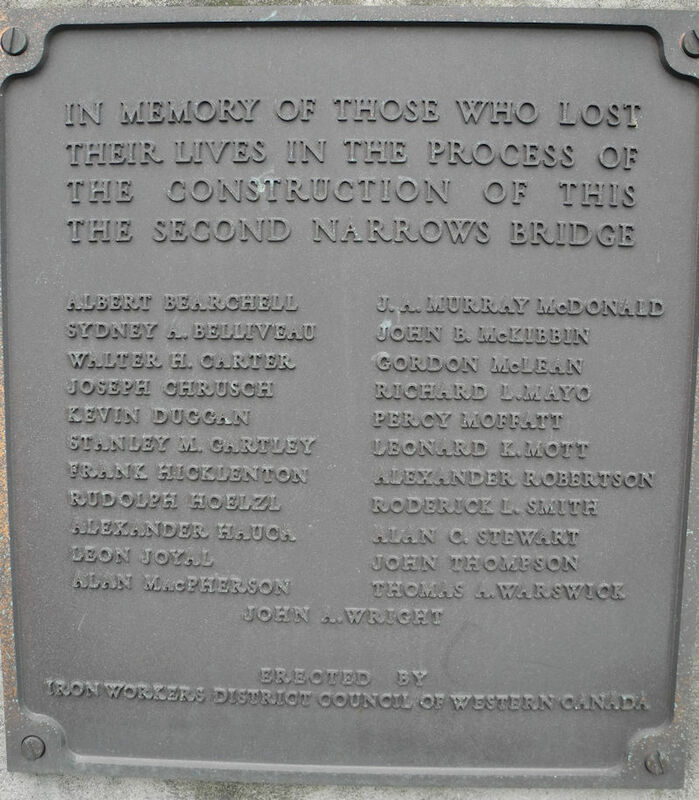 An annual ceremony started in the 1980’s or ‘90’s to commemorate the event and recognize the survivors of the accident and others who worked on the bridge. 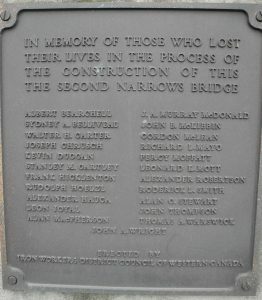 On the memorial cairn there is a plaque recognizing the 23 workers who lost their lives in the construction of the bridge. 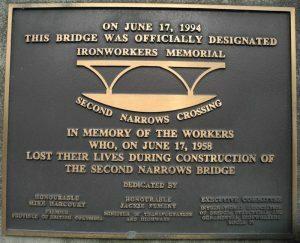 The bridge was renamed the “Ironworkers Memorial Second Narrows Crossing” by the provincial government in a ceremony 17 June 1994. In 1998 the 40th anniversary event was recognized by a small crowd. The 50th anniversary had a much larger crowd of survivors, family members, local political officials, and others including Eric Jamieson the author of the book “Tragedy at Second Narrows”. Over the years speakers have included: Dr Phil Nuytten, a then 16 year old commercial diver who rushed to the scene, Lucien (Luc) Lessard a survivor of the accident who plunged 175 feet from the bridge and into the channel, and Tom Berger a then young lawyer who represented the workers at the Royal Commission of Inquiry investigating the accident. 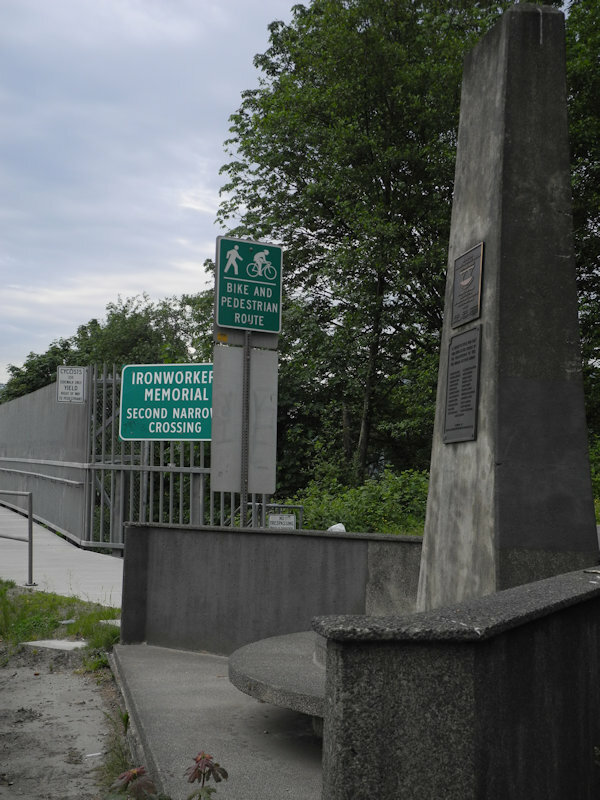 The memorial ceremony will be held at 1 pm on the southeast side of the bridge on Fellowes Street, on the street and in the garden of the adjacent property, followed by a piper leading a walk to the wreath placing at the cairn beside the highway at the foot of the bridge. To reach the location, take Boundary Road to the north end and go one block on Fellowes to North Kootenay. Parking is limited so you may need to park two or three blocks away. Cairn with the plaques and the Bridge sign behind it. To post comments on the OFAAA BC blog, you must register.